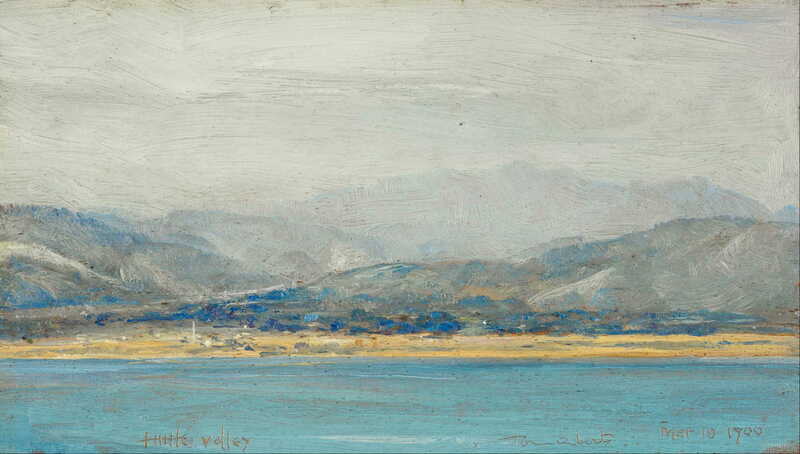 Tom Roberts, Hutt Valley (1900), oil on panel, 10.3 x 19.1 cm, The Museum of New Zealand Te Papa Tongarewa, Wellington, NZ. Wikimedia Commons. 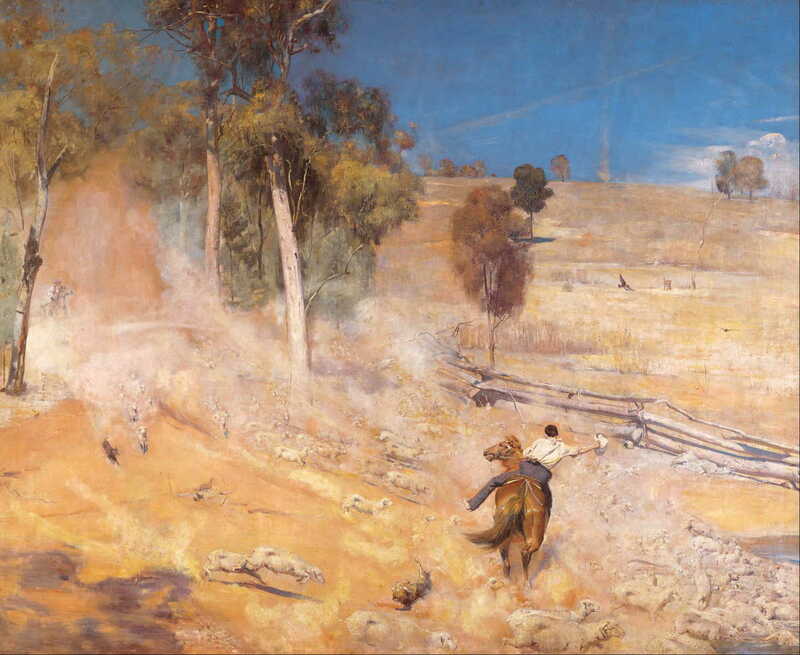 In the late 1880s, several painters started to work in the rural area of Heidelberg, east of Melbourne, adopting a style which later became known as Australian Impressionism. They came together in a momentous exhibition in the history of Australian art, the 9 by 5 Impression Exhibition, in Melbourne, in 1889. The group was alternatively known as the Heidelberg School. 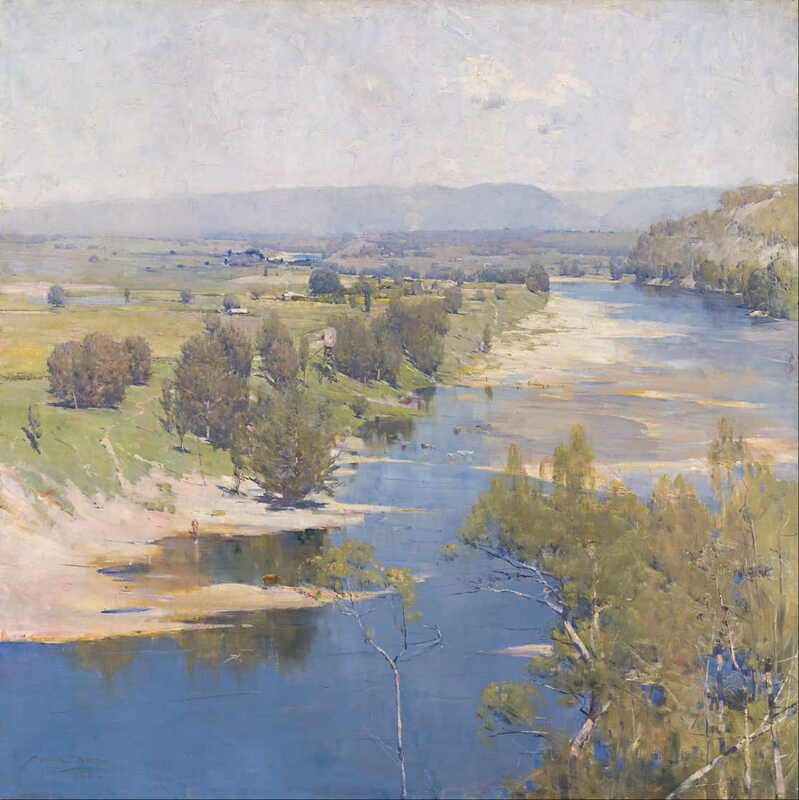 Its principal artists were Charles Conder, Tom Roberts, and Arthur Streeton, who I cover below. 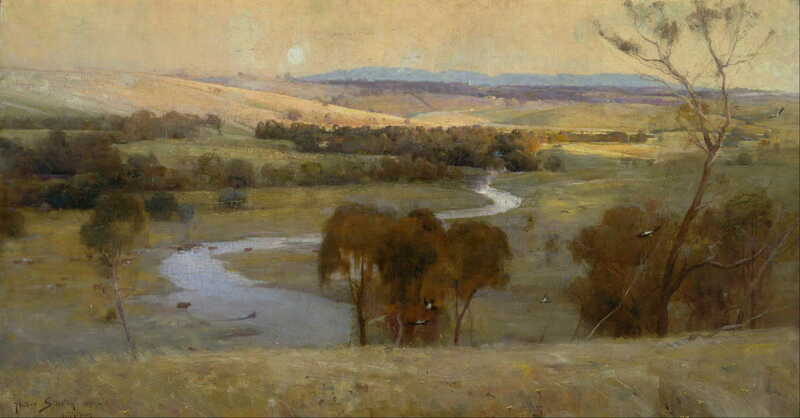 Also associated with the group were Frederick McCubbin, Walter Withers, Jane Sutherland, and several others. The group started in the mind of Tom Roberts, when he was in Spain in 1883, and was formed in 1886 to 1889 as its members met at various places around Melbourne. The 9 by 5 exhibition was named after wooden cigar-box panels, which were 9 by 5 inches (23 x 13 cm) in size, and the support for many of the group’s rough-worked and colourful plein air sketches. Similar panels had been used extensively by Seurat for his oil sketches, for which he had invented the term croquetons. They also resembled the small wood panels which had been used by the Macchiaioli for their plein air oil sketches. The original group disintegrated in 1897, when Arthur Streeton went to Europe. He was born in 1856 in Dorchester, Dorset, England, the son of a local newspaper editor. Following the death of his father in 1868, his family emigrated, arriving in Australia in 1869. They settled in Collingwood, and he first worked for local photographers. He then attended the Trades Hall School of Design, where he was encouraged to paint plein air. He then enrolled in evening classes at the National Gallery School, where he became good friends with fellow student Frederick McCubbin. In 1877 he visited Tasmania, then studied at the School of Painting at the National Gallery School from 1877-9. He went to Europe on a study tour between 1881-5, where he enrolled in the Royal Academy Schools in London. In 1883 he visited Spain, in 1884 Venice, and in 1885 Paris, where he studied at the Académie Julian under Gérôme. 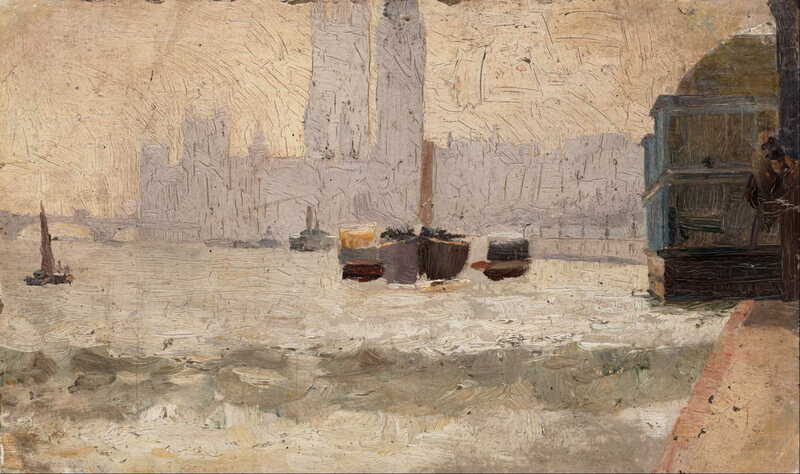 Tom Roberts, Fog, Thames Embankment (1884), oil on paperboard, 31.6 x 46 cm, Art Gallery of New South Wales, Sydney. Wikimedia Commons. He returned to Australia in 1885, where he resumed photographic employment. He started painting plein air landscapes along the Yarra River in Heidelberg that year, producing a series of paintings. In the summer of 1886-7 he rented a cottage near Mentone with McCubbin and Louis Abrahams, and made friends with Arthur Streeton, then one of McCubbin’s pupils. 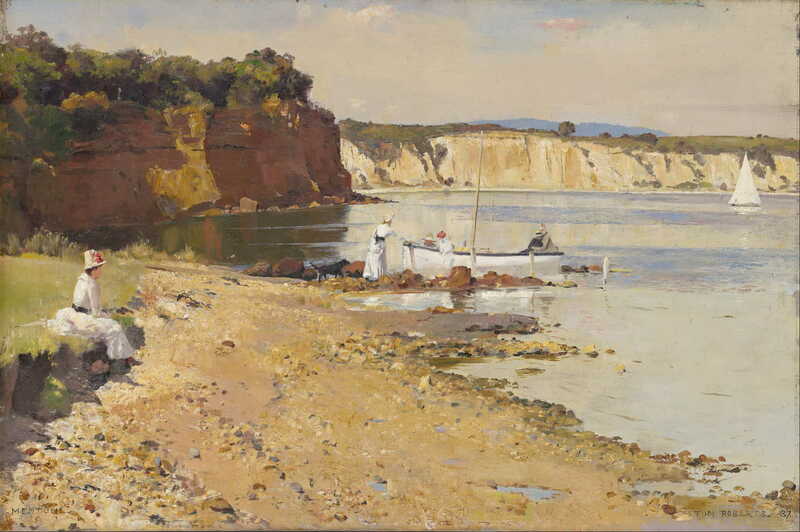 Tom Roberts, Slumbering Sea, Mentone (1887), oil on canvas, 51.3 x 76.5 cm, National Gallery of Victoria, Melbourne. Wikimedia Commons. Tom Roberts, An Autumn Morning, Milson’s Point, Sydney (1888), oil on canvas, 65.3 x 96 cm, Art Gallery of New South Wales, Sydney. Wikimedia Commons. 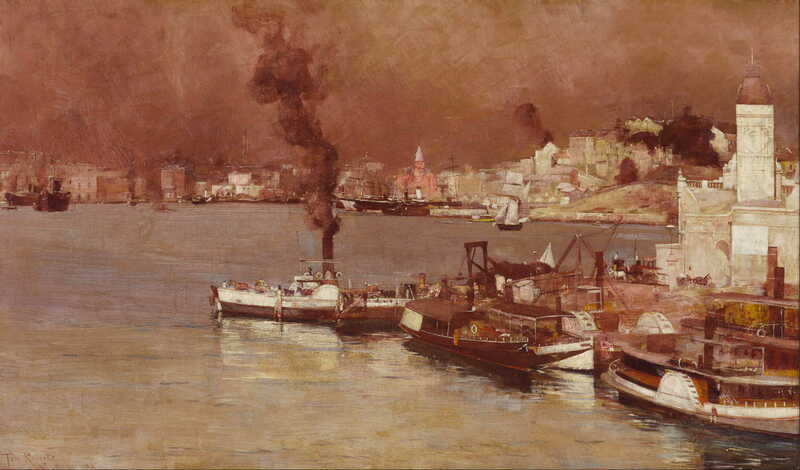 In 1888 he was a founding member of the Victorian Artists’ Society, and visited Sydney. He showed 62 paintings in the 9 by 5 exhibition in 1889. 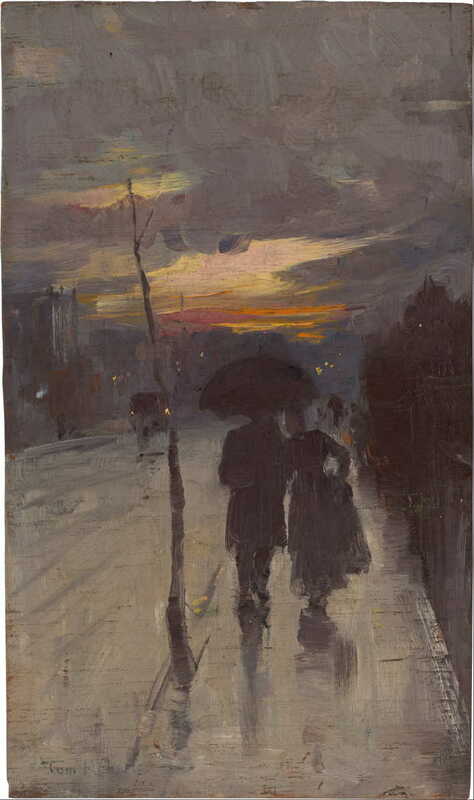 Tom Roberts, Going Home (c 1889), oil on wood panel, 23.4 x 13.6 cm, National Gallery of Australia, Parkes, ACT. Wikimedia Commons. Tom Roberts, A Break Away! (1891), oil on canvas, 137.3 x 167.8 cm, Art Gallery of South Australia, Adelaide. Wikimedia Commons. In 1892 he visited Cape York and the Torres Strait Islands. In 1898 13 of his paintings were shown in the Grafton Galleries, London. In 1900 he visited New Zealand, and the following year was commissioned to paint the opening of the First Federal Parliament in Melbourne. He was exhausted by 1903, and suffering from eye problems, so painted little. He travelled to London in 1903, where he mainly painted portraits, including that of Lord Tennyson. He enlisted with Arthur Streeton at the outbreak of the First World War, but found little time then for painting. He returned to Australia in 1919, then went back to London between 1921-3. He finally returned to Australia in 1923, and settled in South Sassafras, where he died in 1931. Tom Roberts was at heart a realist whose paintings were often rich in light and colour, but whose croqueton oil sketches were much looser and in impressionist style. The dearth of his works in public collections outside Australia has resulted in him being almost unknown, despite the key role that he played in the development of Australian art. He was born near Geelong, Victoria, Australia, in 1867, the son of a teacher. The family moved to Richmond in 1874, where he started work as a clerk in 1880. He studied under Frederick McCubbin and others at the National Gallery Schools from 1882-8, and quickly became fascinated by the French Impressionists, Corot, Millet, and JMW Turner. He held his first exhibition in 1885, and was apprenticed as a lithographer. He started to paint with others in the Heidelberg School in 1886, first at Mentone. In late 1888 he moved into a farmhouse on the Eaglemont estate, sharing at various times with Tom Roberts, Charles Conder, and Walter Withers. 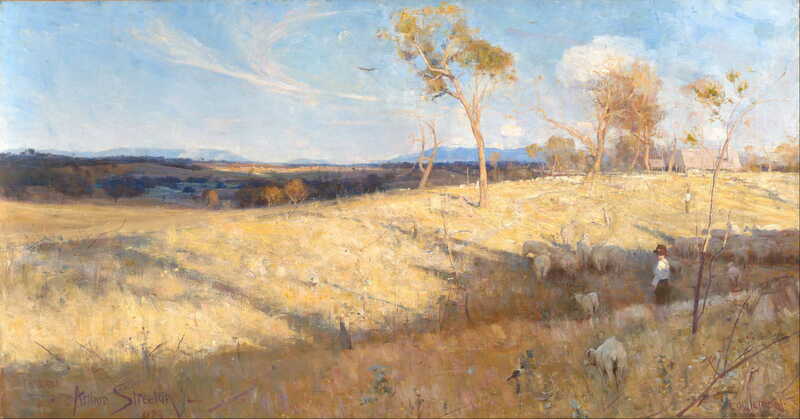 Arthur Streeton, Golden Summer, Eaglemont (1889), oil on canvas, 81.3 x 152.6 cm, National Gallery of Australia, Parkes, ACT. Wikimedia Commons. He showed 40 paintings in the 9 by 5 exhibition in 1889. He then alternated periods spent in Sydney and Melbourne. Arthur Streeton, Still Glides the Stream, and Shall for Ever Glide (1890), oil on canvas, 116 x 188.5 cm, Art Gallery of New South Wales, Sydney. Wikimedia Commons. 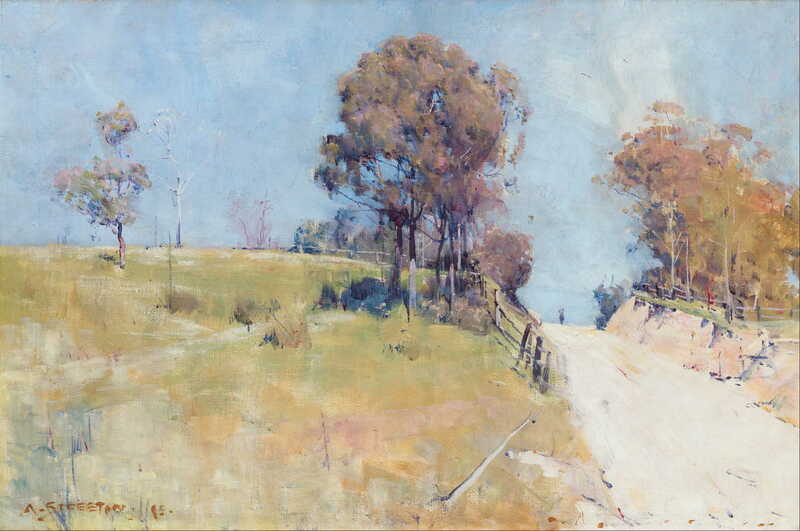 Arthur Streeton, Sunlight (Cutting on a Hot Road) (1895), oil on canvas, 30.5 x 45.8 cm, National Gallery of Australia, Parkes, ACT. Wikimedia Commons. Arthur Streeton, The Purple Noon’s Transparent Might (1896), oil on canvas, 123 x 123 cm, National Gallery of Victoria, Melbourne. Wikimedia Commons. In 1897 he moved to London, visiting Cairo and Naples en route. Arthur Streeton, (House Builders, Cairo) (c 1897), oil on canvas on paperboard, 24.2 x 13.3 cm, National Gallery of Australia, Parkes, ACT. Wikimedia Commons. Arthur Streeton, Cairo Street (Mosque, Sultan Hassan) (1897), oil on canvas on paperboard, 33.4 x 17.1 cm, National Gallery of Australia, Parkes, ACT. Wikimedia Commons. In London he met up with Charles Conder, and was impressed by the Glasgow School artists. He exhibited at the Royal Academy in 1900, and returned to Australia in 1906. The following year he had a successful exhibition in Melbourne, then went back to London, living in St John’s Wood. He honeymooned in Venice, and in 1909 cycled through Dorset with Tom Roberts. He returned to Australia in 1914, shortly before the outbreak of the First World War. This caused him to go back to England, where he joined up in 1915, serving alongside Tom Roberts. The stress took its toll, and in 1917 he was discharged as medically unfit, and went to recuperate. After a period in France as an Australian Official War Artist in 1918, he returned to Australia, where he painted in the Grampians and Dandenong Ranges. He visited Canada and the USA in 1922, and travelled on to London, returning to Australia in 1923. He was knighted in 1937 for his services to art, and died in 1943. Another realist at heart, Arthur Streeton’s brushstrokes were very loose and fine detail more sketchy in plein air paintings throughout his long career. Combined with his portrayal of light, this makes those works appear quite impressionist in style, although he does not appear to have embraced high French Impressionism. He was born in Tottenham, Middlesex, England, in 1868. He travelled to India with his family in 1870, returning to England for schooling in 1877. He emigrated to Australia, in an effort by his father to prevent him from becoming an artist, arriving there in 1884. He first worked in land survey, but managed to paint when he could. In 1886 he started attending art classes, first with the Art Society of New South Wales. In 1887 he began work as an illustrator in Sydney, and sold his first painting in 1888. He also met Tom Roberts, and later that year painted with him. He moved to Melbourne in 1888 where he painted with Tom Roberts, Arthur Streeton, Frederick McCubbin, and Louis Abrahams, and then shared an old farmhouse at Eaglemont with Arthur Streeton from 1889-90. 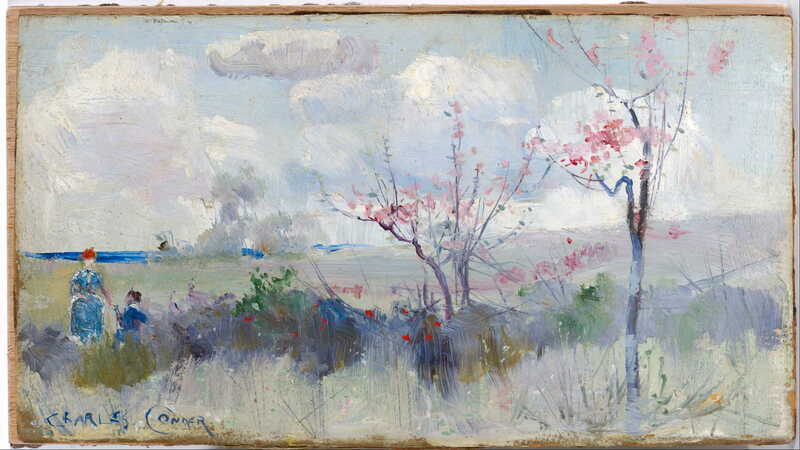 Charles Conder, Herrick’s Blossoms (c 1888), oil on cardboard, 131 x 240 cm, National Gallery of Australia, Parkes, ACT. Wikimedia Commons. 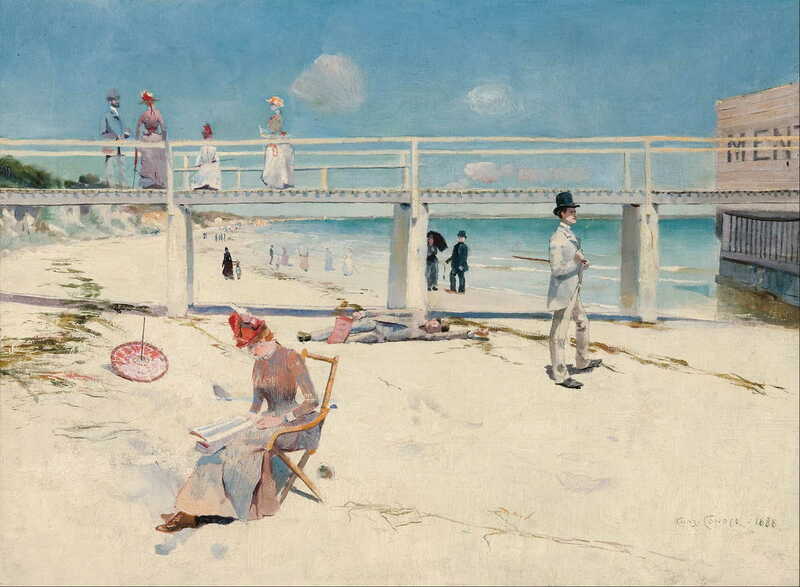 Charles Conder, A Holiday at Mentone (1888), oil on canvas, 46.2 x 60.8 cm, Art Gallery of South Australia, Adelaide. Wikimedia Commons. Charles Conder, Dandenongs from Heidelberg (c 1889), oil on wood panel, 11.5 x 23.5 cm, Art Gallery of South Australia, Adelaide. Wikimedia Commons. He showed 46 paintings in the 8 by 5 exhibition in 1889. 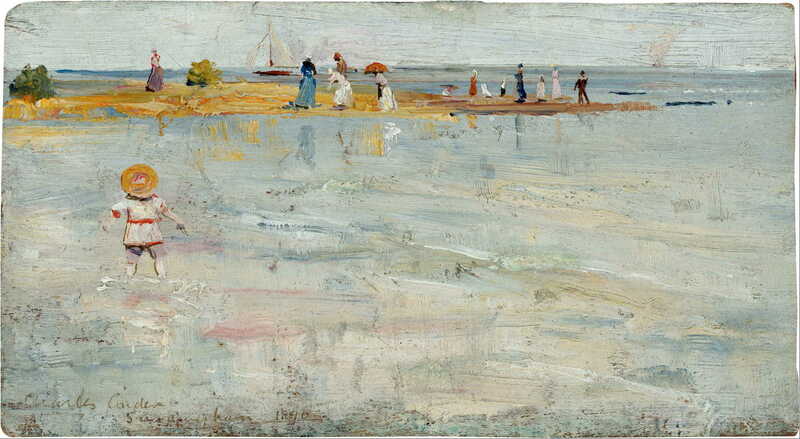 Charles Conder, Ricketts Point, Beaumaris (1890), oil on wood panel, 12 x 21.5 cm, National Gallery of Australia, Parkes, ACT. Wikimedia Commons. 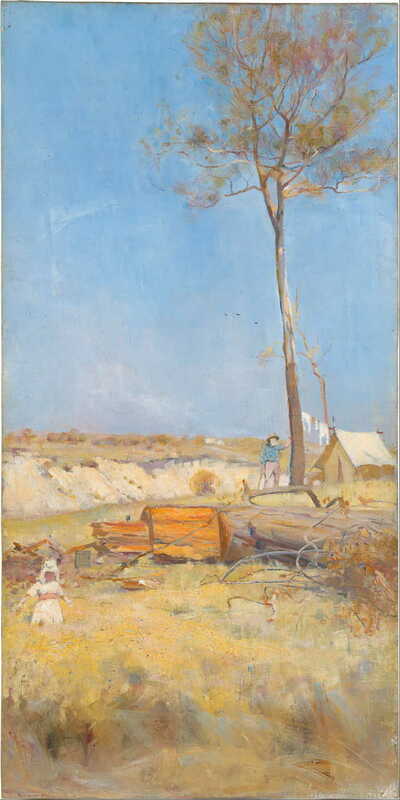 Charles Conder, Under a Southern Sun (Timber Splitter’s Camp) (1890), oil on canvas, 71.5 x 35.5 cm, National Gallery of Australia, Parkes, ACT. Wikimedia Commons. The following year he returned to Europe, visiting Naples, Rome and Florence before arriving in Paris. There he enrolled in the Académie Julian, where he studied under Constant and Lefebvre. 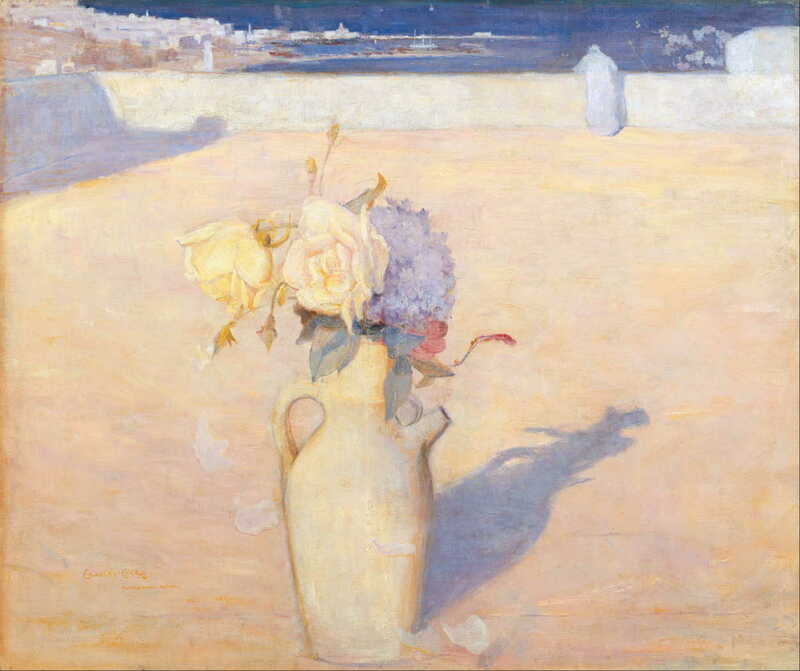 Charles Conder, The Hot Sands, Mustapha, Algiers (1891), oil on canvas, 63 x 72 cm, Art Gallery of New South Wales, Sydney. Wikimedia Commons. His portrait was painted by Toulouse-Lautrec in 1892. Following that he painted on silk, including many fans, a practice that had been adopted by Pissarro and Degas in the late 1870s as part of their japonisme. He settled in England in 1894, but had several episodes of illness. He continued to travel, visiting France, Venice, and Spain. He died in 1909 in England, and by 1913 he was being acclaimed as a modern Master. Charles Conder’s high reputation was soon lost as modernism swept the world after the War, and being largely unrepresented in public collections outside Australia, his sometimes overtly impressionist style has been forgotten. Although some of his paintings were sharply realist, he also painted some of the loosest and most impressionist works of the group. The seminal book Australian Impressionism (2007), published by the National Gallery of Victoria, is currently out of print and unavailable in Europe or North America as far as I can tell, with secondhand prices being absurdly high. Posted in Painting and tagged 8 by 5, Australia, Conder, croqueton, Gérôme, Impressionism, japonisme, McCubbin, Roberts, Seurat, Streeton. Bookmark the permalink. Have you ever been had?